industry on the U.S. East Coast. It preys on numerous other organisms, making these crabs potential competitors for the food sources of native fish and bird species. Below are answers to some common questions and a webinar on how to detect this crab and what to do if you find one. What is the European green crab? There are many common names for Carcinus maenas. In Europe, it is simply called the “shore crab” because it is the most common species of shore crab in the native range. This is similar to how we, in the Pacific Northwest, refer to Hemigrapsus species as “shore crabs,” but it can cause confusion when we talk about crabs with our European colleagues. The Latin name Carcinus maenas translates as “raving mad crab.” Thus, the French know this crab both as “le crabe vert” and “le crabe enragé.” In Germany, it is the “strandkrabbe” or “beach crab.” Perhaps the name with the biggest ‘cool factor’ is “Joe rocker,” another common name used in Europe. What do green crabs look like? Even as an adult, the green crab is smaller than a Dungeness or rock crab (about 3” across the shell). Although called the “green” crab, color is not a distinguishing feature, as the shell (carapace) color of the “green” crab can vary widely. In addition, in the Pacific Northwest we have several native crabs that are also green. The key distinguishing feature of this species are the five spines found to the outside of the eye on the shell. This number of spines is different from any other crab you are likely to see on the beach in our area. Check out Identifying Green Crabs for more details on how to recognize this species. The recent arrival of the green crab on the U.S. west coast is cause for concern. The green crab has already invaded numerous coastal communities outside its native range, including South Africa, Brazil, Australia, and both coasts of North America. An able colonizer and efficient predator, this small shore crab has the potential to significantly alter any ecosystem it invades. It has been blamed for the collapse of the soft-shell clam industry in Maine. The green crab could threaten Dungeness crab, oyster, and clam fisheries and aquaculture operations in the Pacific Northwest and British Columbia. The green crab feeds on many organisms, including clams, oysters, mussels, marine worms, and small crustaceans. Because it can also prey on juvenile crabs and shellfish, a northward spread to the Washington coast and Puget Sound could put our Dungeness crab, clam, and oyster fisheries at risk, and the green crab might compete with native fish and bird species for food. In addition, the green crab is an intermediate host to a marine worm that can harm the health of local shorebirds. How does the green crab travel around the planet? Green crabs may establish themselves in new habitats through various means. Because this species tolerates a wide range of environmental conditions, it is able to travel both by natural and human-mediated transportation. Humans can inadvertently bring green crabs to new habitats in several ways. Scientists have identified ballast water as a major pathway for aquatic introductions, including the larval stage of green crab. Marine vessels take on and discharge millions of tons of water for ballast each day, which often contains aquatic plants, animals, and pathogens. Organisms are discharged with the water in the port of arrival. Some municipalities and ports regulate where and how ballast discharge can occur to reduce the likelihood of introductions. Another likely pathway of introduction is through the movement of live seafood. Green crabs are sometimes present in seaweeds packed with commercial lobsters and oysters being shipped to market. If the packing material and containers are not disposed of properly, the crabs can find their way into new waterways. This pathway was more important historically for green crab introductions, but seafood distribution is currently managed to reduce the possibility of transporting stowaways. The aquaculture industry is also a potential source of green crab introductions, as organisms and the equipment used to manage operations are moved around locally. Recreational boaters can transport species in bait buckets or boat wells, often without realizing it. Live green crabs are also used as bait by recreational fishers in some parts of the world or might be present in the seaweed packed with bait. In addition, they are available for purchase from marine biological supply companies, which will ship live green crabs anywhere, in any quantity, at any time. If the purchaser, who has acquired the crab either for research or as a “pet” doesn’t dispose of the crab properly, or releases it into the wild, the crab is introduced into new habitat. No doubt other human-mediated pathways for introduction of green crab exist as well. Green crab larvae can survive as plankton for up to 80 days. Ocean currents disperse the larvae many miles along the coast. After a period of growth and development in the open sea, green crabs in final larval stage aggregate at night in surface waters. Tides and currents sweep them back into coastal waters where they molt and settle out as juvenile crabs in the upper intertidal zone. If the conditions in their new home are suitable, the crabs could survive and even reproduce, establishing a new population and extending the species’ range farther along the coast. Natural dispersal can be an important means of spread in a region after European green crab have been moved my humans to a new part of the globe. How did the green crab get to Washington? 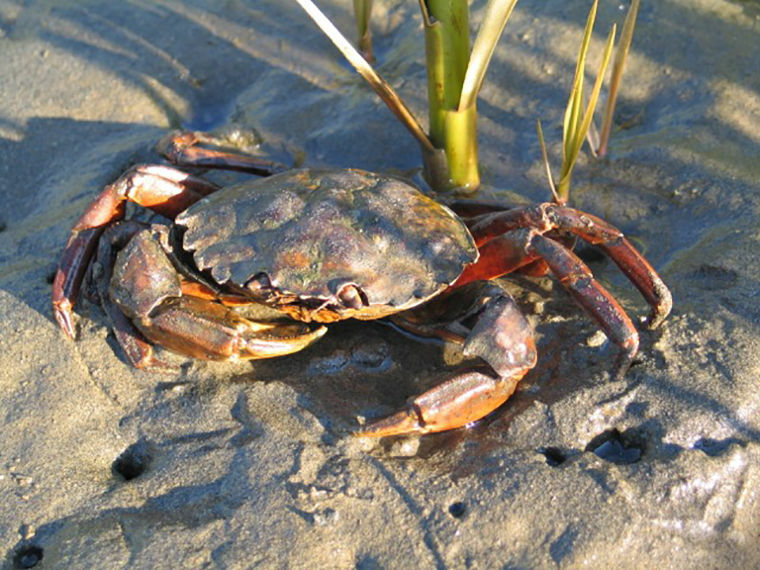 First seen in San Francisco Bay in 1989, the green crab moved southward to Monterey Bay and northward to Humboldt Bay, California, Coos Bay, Oregon, and many other Oregon estuaries. Green crab were sighted in Willapa Bay and Grays Harbor, Washington, and on the west coast of Vancouver Island in 1998 and 1999. Because of the risk posed by this species, green crab were closely monitored in Washington at that time; populations appeared to decline after the initial introduction on the coast, and they were never observed in Puget Sound or the Strait of Juan de Fuca. However, they were very successful on Vancouver Island, particularly in Barkley Sound, and their recent expansion into Sooke Inlet brought them even closer to Washington’s inland shorelines. 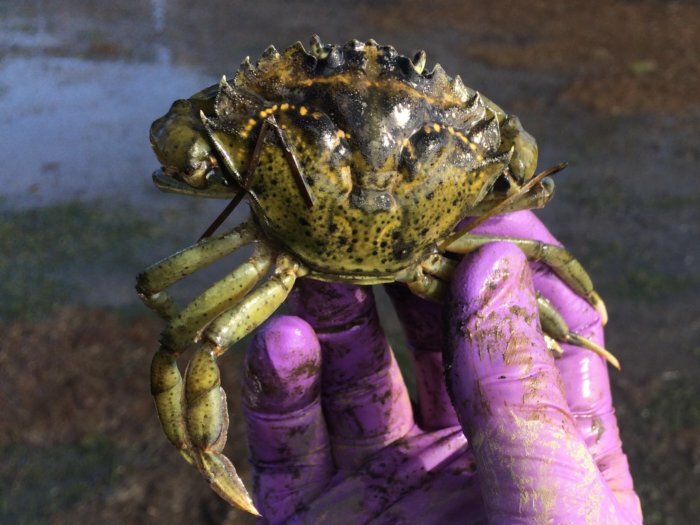 In September of 2016, Crab Team volunteers captured the first confirmed European green crab for inland Washington in Westcott Bay on San Juan Island (details in our blog post). Shortly afterward, a small female was found in Padilla Bay by education staff at the Padilla Bay National Estuarine Research Reserve (blog post). The crabs likely washed in as a larva, possibly from the nearby established population in Sooke. Follow up work was conducted to determine whether there are more crabs in those areas, and whether there are other pockets of habitat where they are living. Read about the results of those surveys on the Crab Team blog. Green crab has been found in inland Washington. What happens now? Once introduced, some non-indigenous organisms find the new environment unlivable and don’t survive long enough to establish a reproducing population. But sometimes, the new environment is favorable to the transported species, and it can live and even flourish. The recent captures European green crab in Washington’s Salish Sea are cause for serious concern, but not necessarily panic. Managing invasions is a bit like preventing wildfires; keep a sharp lookout and respond quickly to small populations before they get too big to control. When a green crab is found and reported, the first step is to conduct more extensive monitoring to discover the size and geographic extent of a potential population. That helps managers plan what level of response is necessary. Currently, the best strategy, once the species has been confirmed at a site, is aggressive trapping and removal, although in most locations, this only serves to reduce, rather than eradicate, the population. Previously, scientists had considered introducing a parasite that infects them in their native range, because the parasite isn’t found on the West Coast. However, it was determined that the parasite could also infect other crabs, so it isn’t a candidate for biological control of green crab (read more in our newsletter article). Chemical control is not an option for green crab either, because it would be nearly impossible to avoid harming native species and ecosystems in the process. To date, green crab have been found at a handful of locations throughout Washington’s Salish Sea, but there are many more sites where we have looked and not found crab. In addition, at most of the sites where green crab have been found, they extremely rare, pointing to very small numbers that might have a difficult time reproducing. This suggests that we are at the very early stages of a potential invasion into our inland shorelines. Ongoing monitoring, and rapid response efforts are the most important tools for protecting our beaches from green crab. How can we reduce their spread? It’s not feasible to prevent larvae from getting washed into and around the Salish Sea – that’s why quickly responding to sightings before the crabs can reproduce is so important. Nevertheless, there are things we can do to help reduce the chance that more crabs could accidentally be moved into the area by humans. Washington State already has a number of prevention measures in place, and their enforcement will help protect shorelines. Movement of shellfish, aquaculture, fisheries, and mariculture equipment and products, even within State waters, is managed by the State, precisely to prevent the movement of things like green crab, other invasive species, and shellfish diseases that could harm those industries and our natural resources. Permits are required for any movement of shellfish, even from parcel to parcel, for both commercial and recreational growers, and might also require special treatment of the shellfish. Even as an individual growing oysters on your beach or dock, you can help prevent the spread of invasives by following the regulations. Only purchase seed that is permitted by Washington State. The permitting process ensures it is free of diseases and pests, and is genetically appropriate for the area. In addition, placement on your site also requires a transfer permit from the State. This permit will be provided by the seller and recorded by WDFW, and will include the origin of the seed, where it was placed (your site) and its health certification. Don’t store any shellfish you have purchased in the water (e.g. off the side of your boat). It should always go in the refrigerator. Not only is this type of storage potentially a health hazard to you, if the shellfish came from another location, they could be harboring invasive species or diseases that could be released into the water. Homeowners should also never place any shellfish purchased from the store, or empty shells from shellfish harvested elsewhere, on their beach. Shellfish purchased from the store are not approved to enter State waters, and should never be released or introduced at a beach, because they can contain invasive species and disease. Shell stock (e.g., oyster shells) needs to be contained upland and certified by the WDFW before deployment. Ships and boats can also move European green crab. In fact, commercial shipping is the biggest “vector” of invasive marine species in the world via ballast (historically solid, but ballast water in more modern times), and fouled hulls (boats that have marine life growing on them). Ballast water management is required for all commercial ships to prevent them from moving species, and these regulations continue to be a necessary part of protecting marine ecosystems worldwide. In terms of recreational vessels, we often think of boats in lakes and ponds as being critical to inspect and clean, but it is important to apply the same principles to boats in marine systems as well. Green crab can be moved in sea chests, or on fouled hulls. Inspecting and cleaning your boat will help reduce the chances you could have an unwanted stowaway tagging along on your explorations. Ongoing prevention is a critically important part of our management strategy, because, even though a few crabs have already been found in the region, every additional crab increases the chance that a population could grow quickly, find a new refuge, and become problematic. What other resources are available to learn about green crabs? Global Invasive Species Database: The International Union for the Conservation of Nature (IUCN) Invasive Species Specialist Group has classified the European green crab as one of the top 100 worst invaders in the world. This page has information on global distribution and effects. 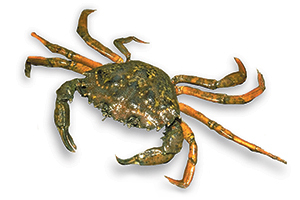 Washington Department of Fish & Wildlife: WDFW is the state agency responsible for management of green crab. This fact sheet summarizes known ecology regulations. U.S. Geological Survey: This site includes a fact sheet, references, maps, and georeferenced data on distribution. U.S. Department of Agriculture: A host of resources, links, and references on the green crab invasion in the U.S.